Dump Pinterest, save elephants. That’s the terrible choice I found myself tasked with making. Here’s something to know about me. I love elephants. I have spent the last couple of years learning about their plight. How they are being poached into near extinction in some places for their ivory so that carving factories in China and elsewhere can make bracelets, objet d’art, and other bric-a-brac that NO ONE on earth could possibly need in the Plastic Age we live in. It’s grotesque and goes against everything I hold and believe in principle. Poaching decimates families, offspring are orphaned (if the poachers allow them to live at all). Many organizations – many, many people – from many countries work tirelessly to end this barbaric practice. Rangers, dedicated heroes who put themselves in the line of fire, have given their LIVES trying to save the elephant. Gunned down in the savannahs, parks and preserves alongside the elephants. In one recent and particularly heinous case, poachers poisoned a water hole with cyanide. Along with 90+ elephants, hundreds of other animals also died. Some estimates put the amount of animals stricken in this case at over 300. Terrorist groups use poaching to fund their operations, which is why the Clinton Global Initiative and other organizations are now becoming actively involved to help stop poaching. Boko Haram, the group most recently known for kidnapping over 200 school girls in Nigeria regularly uses poaching as a funding source. Among the Internet stores and retailers who clearly don’t “get it”, is Rakuten. Based out of Tokyo, the company’s revenues totaled $4.6 billion with operating profits of about $244 million in 2012. Rakuten’s online Japanese retail outlet has 28,000 entries for ivory items for sale. 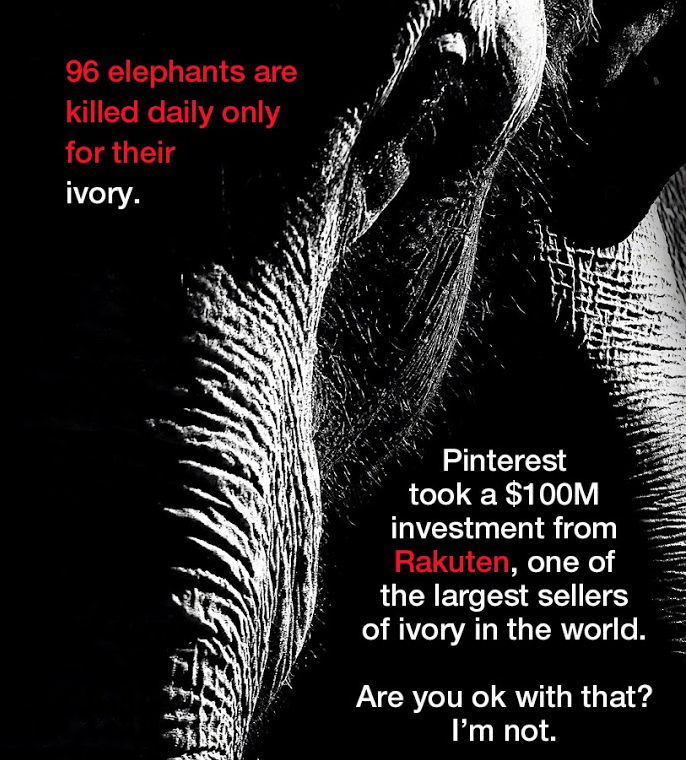 Conservation groups say that Rakuten is the largest online retailer of elephant ivory. If you consider that over 22,000 elephants were killed in 2012 alone, you begin to see that the species clearly cannot survive indefinitely at these rates. All for a bracelet or a bauble and to fund terrorists. Rakuten might as well give the terrorist poachers loaded weapons. Yes, I do love elephants. But I also love Pinterest. I was an early user of the site, many years ago when it was by invitation only. I post things that inspire me as an artist as well as use it to promote my own art. I love that it’s dynamic, and I have loved watching its growth over the years. But I cannot continue to support Pinterest after I learned that they took $100M investment from a company that sells elephant tusk ivory and only recently stopped selling whale meat (good God YUCK). Aside from the fact that this investment also heralds an expansion into a retail-driven Pinterest experience, which really goes against my grain, the elephant thing isn’t going to work for me. All this is a preamble to say that the good folks at WordPress have met my needs and created a theme that allows me to make my own pinboard for my own creative ideas. It will take me a long time, but I hope to get most, if not all, of my pins transported here. It’s a solo experience, being that it is just populated with my “pins”, but I’d love to share my aesthetic with you. If the whole Pinterest-Rakuten thing bothers you too, there are options out there. Indulgy is also very useful, if you are a heavy Google user. There are others. Just do a websearch on “Pinterest alternatives”. No, none are as prolific, ubiquitous, or as beautiful as Pinterest. But you do have options. So, here we go… click the little elephant bug below and I’ll see you over there.